Safe+Sound Somerset is the county’s only non-profit organization exclusively dedicated to serving those whose lives have been impacted by domestic abuse. The organization’s services include emergency shelter, 24-hour call, and text crisis hotlines, an emergency safe house, transitional housing, legal advocacy, individual and group counseling for adults and children, financial literacy, empowerment services, and volunteer Domestic Violence Response Teams. Additionally, Safe+Sound Somerset now offers Prolonged Exposure Therapy and Trauma-Focused Cognitive Behavior Therapy to address Post-traumatic Stress Disorder of adult and child survivors recovering from trauma resulting from their experiences with domestic abuse. Safe+Sound Somerset further provides community education programs to both professional and community groups informing the public about domestic abuse and the services available to those whose lives have been impacted. The organization has been serving people affected by domestic violence for over 40 years. All programs are free of charge, confidential and offered in multiple locations throughout the county. 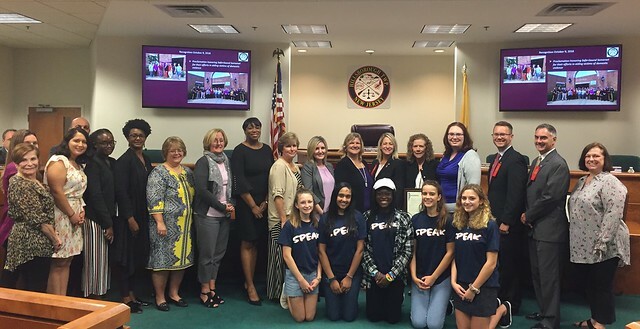 The Hillsborough Township Committee commends the efforts of Safe+Sound Somerset in aiding victims of domestic violence and helping to improve the quality of life for the people in our community.